These responses were provided by The Salvation Army. Thank you for taking the time to tell us about your organization! We’ve been helping people for more than 150 years! We were founded by a man named William Booth who was a bit of a rebel. He challenged tradition for the sake of action and made a huge difference in the lives of people in need. As we look ahead into the next 150 years, we take that tenacity with us. What is your organization’s overall mission? Our mission is to preach the gospel of Jesus Christ and to meet human needs in His name without discrimination. It is our faith that motivates the work that we do, sharing the love that we’ve received so generously. What are a few goals your organization has been focusing on this year? We’re definitely focused on ways to connect with the community, whether that’s creating new opportunities to meet the specific needs of your hometown or finding new ways for people to volunteer or give online. Otherwise, we’re doing what we’ve always done, which includes helping disaster survivors, addressing food insecurity, overcoming poverty, assisting the unemployed, combating addiction, loving the elderly and above all sharing God’s love for everyone. Can you discuss some of your major successes? 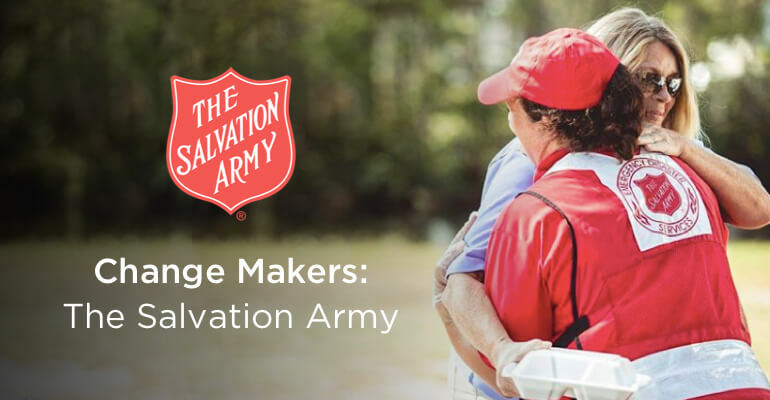 Success in Salvation Army terms is the smile on the face of a mother who can now feed her child; the elderly man who received sustenance and a shoulder to cry on. Over the past year, we’ve continued to serve and rebuild in communities that were impacted by last year’s disasters. Recovery is a process that lasts long after the news crews leave. We also recently opened several homes and made available incredible resources for human trafficking survivors. Can you share a few alarming stats that have low awareness? Human trafficking is a form of modern slavery—a multi-billion-dollar criminal industry that denies freedom to 40.3 million people around the world. What can we do in our daily lives to help support your cause? Take a moment to recognize the need around you. There are hurting people in need of your care and kindness and you can start in your own homes and workplaces. A warm smile and a genuine listening ear can go so far to create connection and build hope. Consider an ongoing donation to The Salvation Army as a way of supporting your neighbors in need. How important are donors for the The Salvation Army? First, we assess the needs of each community in which we serve. We work to understand the obstacles and challenges native to that area. Next, we build local programs designed to offer immediate relief, short-term care, and long-term growth in the areas that will best benefit the community. Then, we offer the local programs to the local community, working to continually optimize their efficacy via spiritual, physical, and emotional service. Without the support of the donor, none of this would be possible. What has been your experience with Giving Assistant? We’re excited to be a part of it and I love seeing the flag pop up when I go to new sites. It gives me so much respect for the brands I’m shopping. I’m also pleasantly surprised to see how many brands are participating! Want to make recurring donations to The Salvation Army? Shop at Giving Assistant’s 3,000+ trusted brands and donate a percentage of your cash back to the The Salvation Army.